Ear piercing, car-fixing, not eating pork, and some miscellaneous photos. Last Wednesday I went to get my ears repierced. The holes had closed up some time ago, and I´d wanted them restored. About the only jewelry I like to wear is earrings, so we´d been looking for a place to do it. And besides, Jim had gotten my a lovely new pair for Christmas. Anyway, we were visiting our ahijados (godchildren) to see their lovely new baby and it turned out that the baby had had her ears pierced ALREADY, and her mom had had another pair of piercings put in her own ears. Their friend, a nurse, had done it for them. I just had to buy the right earings to do it with. Jim and I blithely went to the store that sells lovely gold jewelry in the little mall that has the Coatepec Chedraui. They no longer do piercings there, but the saleslady rummaged around and found just what I needed. SHE said, nowadays they use a pistola (you can guess what that is so it´s really fast and relatively painless. She actually gave us the earrings gratis, for free. We went to our ahijados' house for the deed to be done. They live with our ahijado's parents in a very pretty house filled with all kinds of interesting things. Now it was filled with an audience: the ahijados, their parents, and a friend and the baby and Jim. My ahijada had said, "Nah, it doesn´t hurt." Last time I believe her! The nurse, a very pretty young woman had me sit in an armchair and then she went to work pushing the stem into my earlobe by hand. Oy!!! And all these people were watching! I want to tell you, I was brave, brave, brave and turned all the screams I really wanted to let out into funny noises that made everyone laugh. It felt like hours, but a few minutes later it was done. "Why didn´t you tell me it would hurt," I wailed. "You wouldn´t have come to have it done," my ahijada said. So Sunday we went back so our ahijado could fix the dent in our pretty new Nissan X-Trail. NOT my fault, by the way. Just the scrape on the back door is my fault. Jim would dispute whether it should just be called a scrape or whether dent might be more accurate. ANYWAY, Jim backed up into a short post in Plaza de las Americas, the fancy shopping mall in Xalapa. Even dent is too kind for the cavern he put in the bumper. Our ahijado said he could pour hot water on it and pull it out! We were skeptical, but we thought we´d let him give it a try so Jim pulled the front end of the car into the garage. It was one of the few sunny times we´ve had lately. People were walking up and down the road with their groceries and all kinds of other stuff. Horses clip-clopped by with riders and laden with firewood. A lone chicken went over to look questioningly at the chickens in our friends' ample pen where turkeys also displayed their finery. I was nervous and not really happy watching what looked like major surgery on the car but I drifted over from time to time to watch our ahijado remove what seemed like a hundred screws and six or seven car parts. It turns out that access to the bumper wasn´t easy. After a visit inside to see Doña J and our ahijada and the baby, I went back outside to find that the cavern had actually been eliminated! Jim always pays even though our ahijado would never ask him to. In fact, Jim and I have learned that even people we don't know won't give a price for individual work where we live. "How much?" we used to ask. "Whatever you think it's worth," or "whatever you want was usually the answer. So anyway, a few days ago, our neighbor had a pig butchered and sold the pieces from a table outside his house. With the bad coffee harvest and the fact that here, too, or even more, it's really only the top one percent who are doing well, a lot of people are doing stuff to make themselves enough to get by on, or maybe to cover an unusual expense. So the butchered pig. The guy across the street from us has four concrete stalls which sometimes hold horses and sometimes pigs he raises to sell for butchering. When the pigs are moved, bathed, or, yes, slaughtered, they make terrrible, rending sounds which I can barely stand to listen to. I want to run out and save them. So the neighbor´s nieces came up to our house with some small ribs wrapped in a styrofoam dish for us and it was impossible to say no. It turned out neither Jim nor I could bring ourselves to eat it. The dogs got lucky! Below are some random photos which I don´t think I've posted before. Chedraui, our supermarket, generally has a flamboyant display of produce. We like to go to the market or one of the small vendors, but we are too much Amerkans not to sometimes yield to supermarket temptation. This is a lot of garlic, also in Chedraui. Clouds building outside our window. Below are some youngsters at their primary school leaving ceremony. How the weather has been here lately. Not like a tropical paradise! Someone up north commented on facebook that she was envious of our weather right now. Gimme a break, I say. Her weather may be colder outside, but it isn't colder inside, I can guarantee it. I am writing this with two shirts, two sweaters and cold hands. Today the high is supposed to be 18°, two degrees warmer than yesterday, and the low 8°. Okay, okay, it's celsius. Fahrenheit: 64 and 46. And it´s damp and the sky is solid dirty gray except on the mountain Acamalín, directly across from us there is a soft pillow of fog. This has been going on for days. Remember, people don't have heat in their houses. We have a wood stove which heats our main room to tolerable and so we are lucky. We hadn´t used it until this morning, partly because the wood is all damp, even that which has been protected, so it's hard to get going. The really disturbing news is that the coffee harvest is lousy. This is because a fungus not previously known at our altitude has made its way up to us. It's called la roya. It spreads as a fine dust,and it is wreaking havoc with coffee and with our neighbors' livelihoods. Normally, the height of the coffee picking season should be about now. Normally,the ejido land which surrounds our colonia you could walk the paths through the coffee, and hear the voices of the pickers, often family memberss, drifting around, You could see the workers carefully pulling off the properly ripe berries, say hi to those you know. Burros and horses would be tied along the path waiting for their masters to load sacks on their backs. Dogs would run through the underbrush. At meal times, people would gather around to have tortillas and salsa and soda, hot beans and eggs, cooked on small fires. Workers who don´t have coffee of their own work for other people, and they move from place to place. Sometimes a pickup waits on the road for them to hurl their sacks of coffee into. Our area is ideal for growing coffee de altura, coffee grown at a higher elevation. It has plenty of shade, soil mulched by years of harvest remnants and banana plants, cool weather. It is easy under normal circumstances to grow it organically, too. And it tastes delicious. I´m drinking a cup from our own beans right now. But this year, the losses are breathtaking: some people have lost all their plants to la roya. The average loss is apparently 85%. Even if the coffee hasn´t succombed to la roya, the price per kilo has fallen sharply. The coffee de altura is usually high quality coffee. Unfortunately much of both it and the cheaper and not so good and not organic coffee planted on huge numbers of flat acres across places like Vietnam are in the hands of giant food companies. 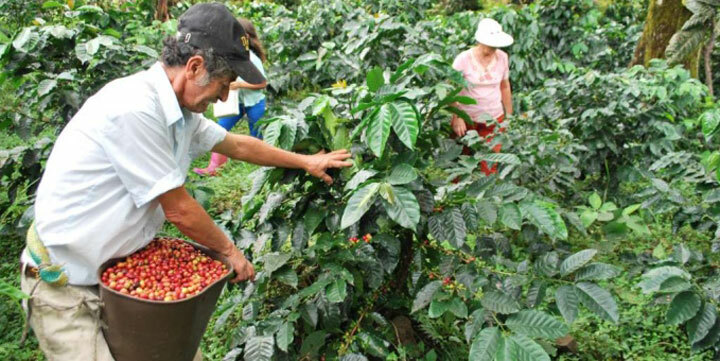 As you can see in the photo above taken from Revista Industrial de Campo, coffee is labor intensive with the berries, only the ripe ones, picked by hand.